Adam Watson, who died in 2007, was a former diplomat who in his later academic career became a pioneer of the discipline of international relations. 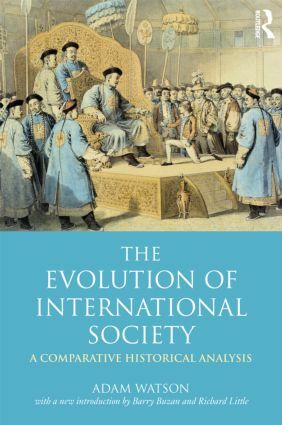 Originally published in 1992, The Evolution of International Society made a major contribution to international theory and to our perception of how relations between states operate, and established Watson’s place within the canon. This acclaimed and uniquely comprehensive work explains how international societies function across time, starting by examining the ancient state systems before turning to look in detail at the current worldwide international society. The book demonstrates that relations between states are not normally anarchic, but are in fact organized and regulated by elaborate rules and practices. In this timely reissue, a new introduction by Barry Buzan and Richard Little assesses Adam Watson's career as a diplomat and examines how his work as a practitioner shaped his subsequent thinking about the nature of international society. It then contextualises Watson's original work, situates it alongside current work in the area and identifies the originality of Watson's key arguments, helping us to understand Watson’s place within the canon.